This article is about stone structures in general. For the house designed by William Burges in London, see The Tower House. For the Grade II-listed building in Brighton, see Tower House, Brighton. After their initial appearance in Ireland, Scotland, Basque Country and England during the High Middle Ages, tower houses were also built in other parts of western Europe as early as the late 14th century, especially in parts of France and Italy. In Italian medieval communes, tower houses were increasingly built by the local barons as power centres during times of internal strife. 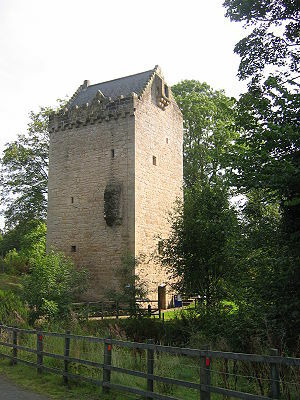 Scotland has many fine examples of medieval tower houses, including Crathes Castle, Craigievar Castle and Castle Fraser, and in the unstable Scottish Marches along the border between England and Scotland the peel tower was the typical residence of the wealthy, with others being built by the government. In seventeenth century Scotland these castles became the pleasurable retreats of the upper-classes. While able to adopt a military nature, they were furnished for comfort and social interaction. Tower houses are very commonly found in northern Spain, especially in the Basque Country, some of them dating back to the 8th century. They were mainly used as noble residences and were able to provide shelter against several enemies, starting with the Arabs and later Castile and Aragon. However, due to complex legal charters, few had boroughs attached to them, and that is why they are usually found standing alone in some strategic spot like a crossroad, rather than on a height. During the petty wars among the Basque nobles from 1379 to 1456, the upper floors (with defensive capacity) of most of them were demolished. Few have survived unscathed to the present day. Since then they have been used only as residences by their traditional noble owners (Saint Ignatius of Loyola was born in one of them, which stands to this day) or converted into farm houses. To the west of the Basque Country, in Cantabria and Asturias similar tower houses are found. Furthest west in the Iberian peninsula in Galicia, medieval tower houses are in the origin of many Modern Age pazos, noble residences as well as strongholds. In the Balkans, a distinctive type of tower house (kule) was built during the Ottoman occupation, developed in the 17th century by both Christians and Muslims in a period of decline of Ottoman authority and insecurity. The tower house served the purpose of protecting the extended family. In the Baltic states, the Teutonic Order and other crusaders erected fortified tower houses in the Middle Ages, locally known as "vassal castles", as a means of exercising control over the conquered areas. These tower houses were typically not intended to be used in any major military actions; for this purpose the crusaders relied on a number of larger order castles. A number of such tower houses still exist, well-preserved examples include Purtse, Vao and Kiiu castles in Estonia. In Svaneti, Georgia, there are also some medieval settlements famous of their tower houses, like Chazhashi and Ushguli. The Yemeni city of Shibam has hundreds of tower houses which were the tallest in the world. Many other buildings in the Asir and Al-Bahah provinces of Saudi Arabia also have many stone towers and tower houses, called a "qasaba". There are also numerous examples of tower houses in Georgia in the Caucasus, where there was a clanlike social structure (surviving here into the 19th or even 20th century) in a country where fierce competition over limited natural resources led to chronic feuding between neighbours. One theory suggests that private tower-like structures proliferate in areas where central authority is weak, leading to a need for a status symbol incorporating private defences against small-scale attacks. Similarly, hundreds of Tibetan tower houses dot the so-called Tribal Corridor in Western Sichuan, some 50 metres high with as many as 13 star-like points, and the oldest are thought to be 1,200 years old. Most notable in the New World might be considered a focal element of the Mesa Verde Anasazi ruin in Colorado, United States. There is a prominent structure at that site which is in fact called the "tower house" and has the general appearance characteristics of its counterparts in Britain and Ireland. This four-storey building was constructed of adobe bricks about 1350 AD, and its rather well preserved ruins are nestled within a cliff overhang; moreover, other accounts date this ruin somewhat earlier. The towers of the ancient Pueblo people are, however, both of smaller ground plan than Old World tower houses, and are generally only parts of complexes housing communities, rather than isolated structures housing an individual family and their retainers, as in Europe. Wikimedia Commons has media related to Tower houses. ^ A. Mackechnie, "'For friendship and conversation': Martial Scotland's Domestic Castles" Architectural Heritage XXVI (2015), pp. 14, 21. ^ Grube-Mitchell 1978, p. 204: "a distinctive form of defensive tower-dwelling, the kula, developed among both the Christian and the Muslim communities during the insecure period of the decline of the Ottoman authority in the 17th century ..."
^ Greville Pounds 1994, p. 335: "In southeastern Europe, where the extended family was exemplified as nowhere else in the western world, the home itself was often protected, giving rise to the kula or tower- house." Johnson Westropp, Thomas (1899). "Notes on the Lesser Castles or 'Peel Towers' of the County Clare". Proceedings of the Royal Irish Academy. 20: 348–365. Greville Pounds, Norman John (27 May 1994). The Culture of the English People: Iron Age to the Industrial Revolution. Cambridge University Press. Retrieved 10 May 2012. Ernst J. Grube, George Michell (1978). Architecture of the Islamic world: its history and social meaning, with a complete survey of key monuments. Morrow. Retrieved 10 May 2012.